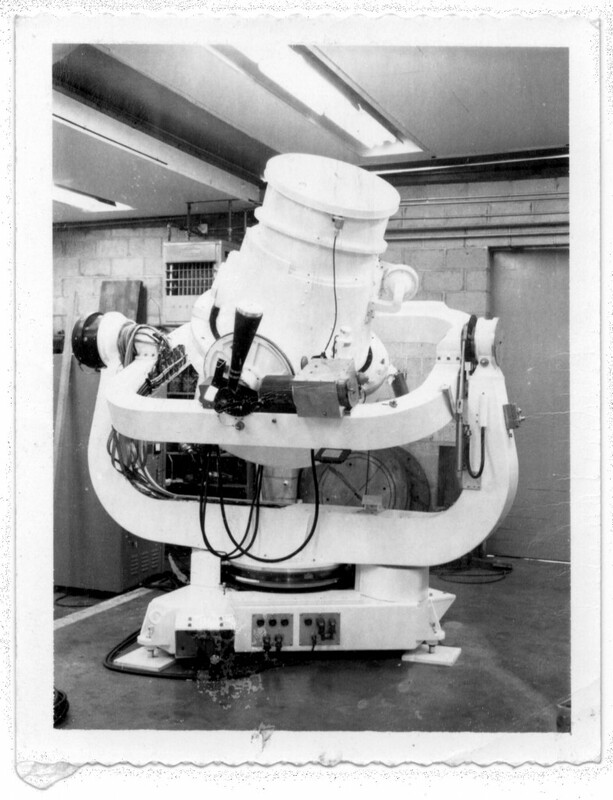 The Baker Nunn Missile Reentry Tracking Camera was designed to have a triangular base. A 150-lb/ft Inland Torque Motor was installed in the base assembly and rotated the fork plus or minus 200 degrees in azimuth rotation. A 100-lb/ft Inland Torque Motor rotated the gimbal-ring mounted to the fork-tines would rotate the gimbal-ring plus or minus 80 degrees in elevation. 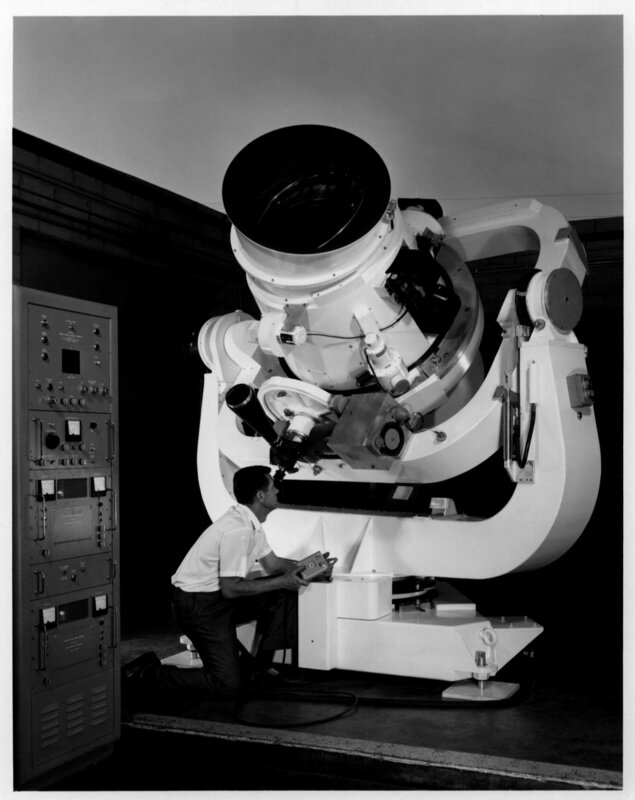 Mounted in the center of the gimbal-ring was the optical camera tube assembly. The camera assembly could be motor driven plus or minus 70 degrees in a 2nd elevation axis that was 90 degree to the 1st elevation axis. The Baker Nunn Missal Reentry Tracking Cameras consists of a three-element 20-inch entrance aperture corrector lens system. Mounted on top of the corrector lens assembly is a multi-set of triangular prisms converting the incoming sky image into a spectrum image. It was thought a spectrum image of the incoming missile would determine which was the real missile and which was decoy chaff that had been released prior to reentry. The corrected spectral image is then projected down to a 31-inch f/1 spherical primary mirror. The focusing converging image is then reflected back up to a 4-inch x 6-inch x 0.6-inch thick mosaic of fiber-optics making film supporting focusing plate. This focusing plate is constructed by bonding together hundreds of small hexagonal fiber optic bundles. It was ground and optically polished on one side to the curved focal plane. The opposite side was optically polished flat. The imaged projecting up from the primary mirror would focus on the on the curved focal-plane side of the fiber-optics mosaic. This enabled the curved focused image to be transferred thru to the opposite of the fiber optics mosaic. The emulsion side of the 4-inch wide film would be in contact of the flat side of the fiber-optics mosaic when an exposure is made. Five different exposure transit speeds were available. The fastest speed was five frames per second. Setting this exposure and transit at five frames per second, the film was entering, stopping for an exposure and exiting at an unbelievable rate of speed. Transporting the film was accomplished by blowing an air blast in into the film supply canister. This air blast would create a 6.25-inch floating loop of film in this supply canister. To advance the film, a blast of air into the film take-up canister would then pull the film across the film bridge from the supply canister creating a new 6.25-inch replacement floating loop of film in the take-up canister. This trading air between the two canisters would pull the film across the film bridge. The size of the loop and frequency between the air blasts would establish the length and timing for the proper exposure time. The film would stop with its trailing length ready for the next exposure. A stall-torque motor was continually taking up any slack exposed film in the take-up canister. The stall-torque motor would keep the film taught when the exposure was taken. There was a film back-up plate between the flat side of the fiber-optics mosaic and the back-up plate. There was just enough space between the fiber-optics mosaic surface and the back-up plate for the film to slide freely during its transit and keeping it in focus against the fiber-optics mosaic. A selectable speed worm and gear drive would drive the camera assembly tracking a satellite passing overhead. Selectable transporting speeds could be implemented for tracking different satellite transit speeds. Baker Nunn Kwajalein Slit-less Spectrograph camera for U.S. Air Force. Boller and Chivens General manager Frank Shafer, operating the camera. The Baker Nunn Missile Reentry Tracking Camera was installed on Kwajalein Atoll in the South Pacific. The location is approximately 5-degrees north of the equator. Missiles launched from the Vandenberg, California would pass over the Pacific Missile Range. The missile would enter earth’s atmosphere over the Kwajalein Atoll. A Nike Zeus missal test launching station was also located on the Kwajalein Atoll adjacent to the Missile Reentry Tracking spectrograph camera. The purpose of the spectrograph camera was to photograph through spectroscopy photos of the incoming missiles. The photos would determine what were the differences of a real incoming missile and the decoy chaff traveling along with the missile. The photos had to be taken of the missile well before it reached an incoming altitude of 100,000 feet. A Nike Zeus missile would be launched programmed to intercept the real incoming missile with information from the spectrograph camera photos. The only similarity of the Slit-less Spectrograph camera was the basic Cameras Mount outline and the Dr. James Baker optical design. The Shutter Assembly, the Film Size, the Film Transport System and the Cameras Mount’s Positioning Mechanics were completely redesigned.